During take-off run from runway 31 at Tarija-Carapari Cap. Av.Oriel Lea Plaza Airport, the aircraft began to veer to the right. 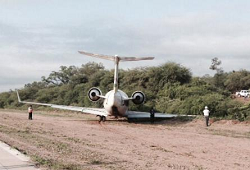 The pilots were unable to correct the deviation until the Canadair ran over soft ground. The take-off was aborted but the aircraft continued to roll over soft, sandy ground until it came to a stop with its nose against the edge of a earth mound, about 25 meters to the side of the runway. It is understood that there were no injuries to passengers or crewmembers. At the time there were no adverse weather conditions in the area. 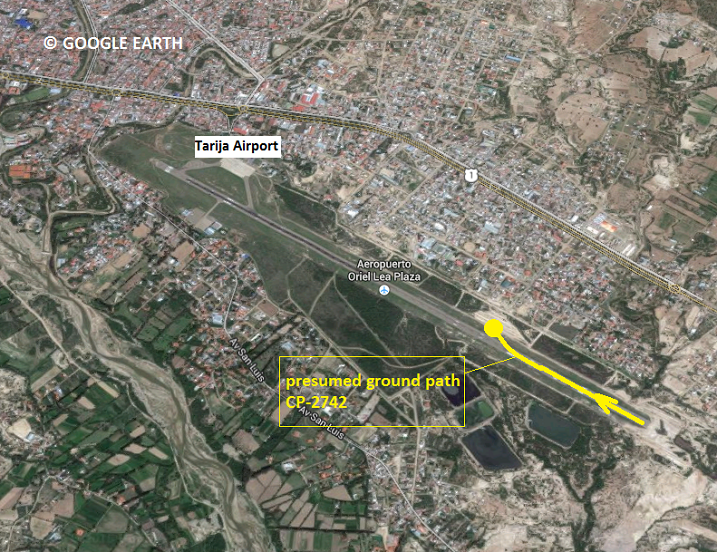 Tarija Airports has a single runway which is 3050 meters long and 45 m wide. There is no parallel taxiway and no broadened ends to allow u-turns.